Plat Books have always been mobile by nature. When you think about it, the entire concept of an 8.5” x 11” map atlas is to allow you to view maps at a desk, in a car, or out in the field. This mobile functionality makes plat books an ideal resource tool for a variety of commercial industries that deal with landownership. While plat books continue to be a valuable mapping resource, their value can increase when you start to utilize them with new digital technology. Most people are familiar with Google Maps, essentially the default mapping app for finding how to get from point A to point B. The location and routing ability that Google Maps provides is extremely valuable, but there is one glaring shortcoming to this technology. Google Maps is 100% reliant on having a data connection, whether it be cellular coverage or WiFi. Without a data connection, you can’t see where you are on the map, because there is no map loaded on your device. This is where MobilePlat comes in! 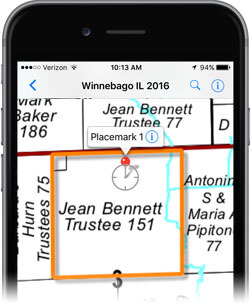 MobilePlat is a seamless, geo-referenced county plat map. The map is specifically designed to import and view offline in a free mobile map app called Avenza Maps. Avenza Maps app uses the built-in GPS in your mobile device to locate yourself on whatever georeferenced map you have imported. The location ability still works even when you are offline and don’t have cellular coverage since every mobile device has built-in GPS. This is a huge benefit for plat map users. You can save a lot of money by not having to use an excessive amount of data since the maps can be stored on your device and used offline. MobilePlat is a great option for any plat map user that wants to take advantage of the mobile functionality of the plat book, but also utilize the location ability that our smartphones offer. You can preload multiple maps in your phone before you are out in the field and not worry about whether you’ll have a network connection. 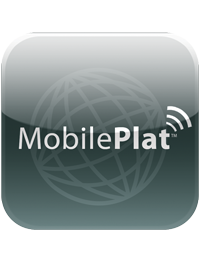 Thanks to MobilePlat, finding out who owns the land you’re standing on has never been easier.